A very good phone with all the features. 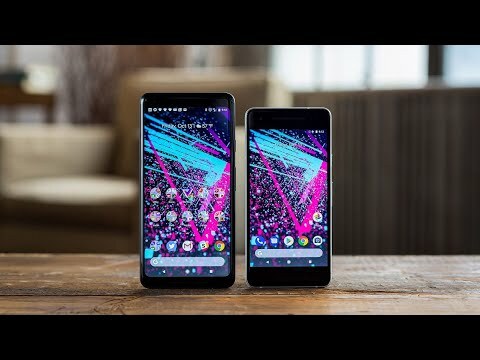 Best phone from the tech giant Google. If you need a phone for long term usage, this is the best you can get in this price range. Timely updates, snappy performance, best camera, great audio experience makes it a dream phone. This phone is handy, feels good in hand, and doesn&apos;t weigh much either. You get the best and smoothest android experience when owning a Google phone. If you are looking for a phone above 35000 bracket go for pixel 2 undoubtedly. Value for money and totally recommended. Great camera, great speakers, buttery smooth software experience and 3 years software updates from Google makes the Pixel 2 an exceptional smartphone despite the big bezels. Also the smaller version doesn&apos;t suffer from screen problems like the Pixel 2 XL. I would say the best pure android experience on the phone with the best camera on any smartphone right now, This is hands down an amazing phone and I would totally recommend it. 8 Pricebaba users have written their experience with Google Pixel 2. If you own Google Pixel 2, please do leave your feedback too. The Google Pixel 2 is the company's flagship device for the year 2017. The device is touted as the smartest phone for the year as it features artificial intelligence as an integral part of its software. Since the phone is made by Google, it rocks the latest iteration of Android out of the box and will be the first in line to receive updates. On the display front, the Pixel 2 sports a 5-inch Full HD display powered by AMOLED technology having a resolution of 1920 x 1080 pixels. This display is hence capable of reproducing a crisp pixel density of about 441 PPI which is plenty sharp and thanks to the AMOLED display panel, it will be able to show dark black colours as well. To top it off, the phone also features Corning Gorilla Glass 5 protection to keep its display safe from cracks from an accidental drop. Underneath its hood, both the Pixel 2 and Pixel 2 XL feature similar specifications. Both phones are powered by the octa-core Snapdragon 835 SoC from Qualcomm ticking at 2.35GHz. It also packs in an Adreno 540 GPU for enhanced graphics performance. In order to keep the phone lag free and ensure a seamless experience, Google has provided 4GB of RAM with the device. While the box-shaped design may seem dated, the colour and texture combination look pretty impressive on this phone. The Pixel 2 sports a metal body with a dual tone colour at the back. The upper half of the back has a glossy feel to it while the lower half has more grip to it which is expected to smoothen out with time. On the front, the regular Pixel 2 features substantial bezels on the front accompanied by the 5-inch screen and two front firing speakers. The phone ships in three colour variations which Google has named as Clearly White, Just Black and Kinda Black. On the audio front, the phone sports stereo speakers located above and below the screen respectively. This means they fire sound towards you when you are watching a video thereby providing a great experience. Unfortunately, the headphone jack has been eliminated as far as the Pixel 2 series go, however, it is replaced by the USB Type-C connector which doubles up both as a charging port and a headphone jack. On the connectivity front, the phone offers support for multiple 2G, 3G and 4G bands, VoLTE, dual-band WiFi, and Bluetooth.